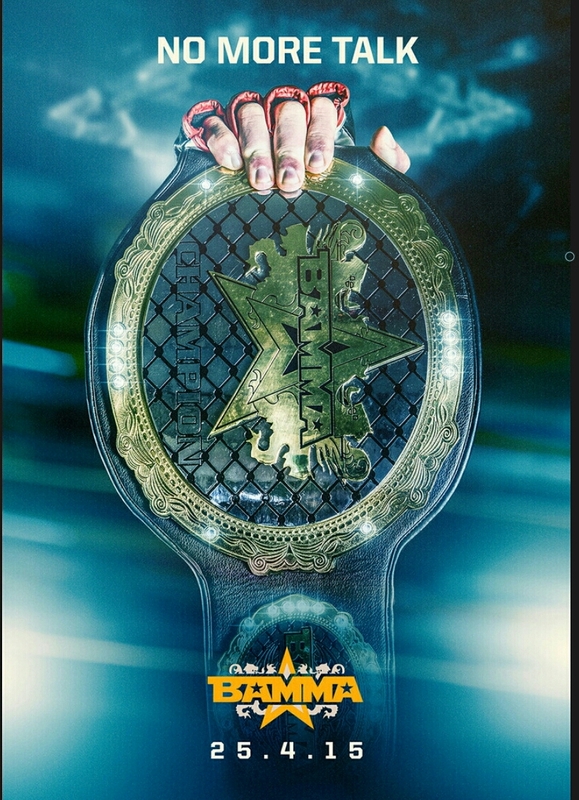 BAMMA, leaders in MMA sports entertainment and the home of European MMA, is proud to announce former World Heavyweight Boxing Champion David “Hayemaker” Haye as the newest addition to the BAMMA presenting team. 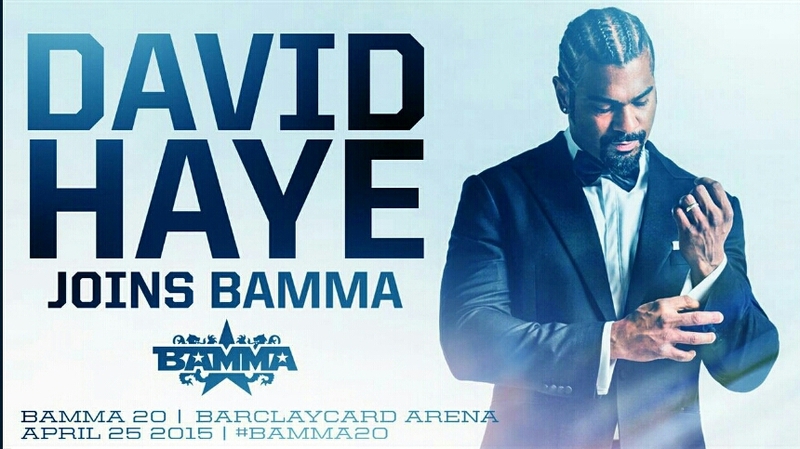 David Haye Joins BAMMA presenting Team. Joining the team on a long-term basis, Haye’s first action will be for the live broadcast of BAMMA 20 – airing on Spike TV and across the globe on Saturday April 25th. No stranger to the big fight nights, Haye will help guide viewers through all the adrenaline fuelled action at the Barclaycard Arena in Birmingham, as BAMMA delivers one of its biggest and best events to date. The former world Heavyweight champion, who has fought some of the world’s best boxers including Wladimir Klitschko, Nikolai Valuev & Dereck Chisora, will bring his own unique insight and perspective on the sport of MMA to BAMMA fans worldwide. 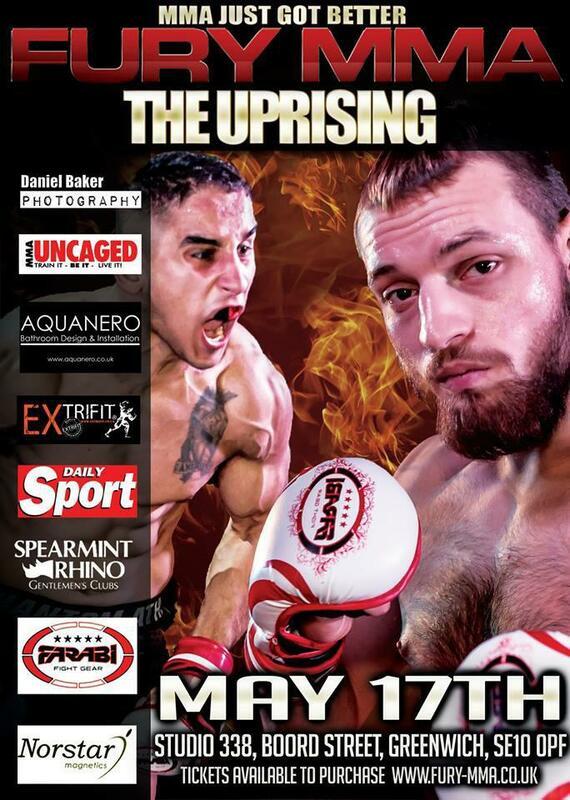 Here is the Fight card as it stands so far for Saturday, April 25th. Back in July 2013 I caught up with Bryony Tyrell, a 34 year old married mum of two from Southampton, you may also be thinking who? But after this reading this interview, this is one person who will be firmly on the Tip of your Tongue. EB. Hi Bryony thank you for your time today, I know that you’re a very busy person. BT. Thank you very much for asking me. EB. You’re a Nurse, working in Cardiac Intensive care at Southampton General Hospital, and you also do Clinical Research as your job, how do you cope with this really stressful job? BT. Yes, that’s right I work 30 hours a week, not quite full time, although sometimes it feels like it! It can be stressful but I’m very lucky to work in a fantastic team who help and support each other. EB. You also hold a Master Degree in Nursing and a Degree in Molecular Cell Biology, do you want to study further and gain more knowledge in this area, or is this enough studying for you? BT. I’ve only just finished my Masters so I definitely need a break from studying. I would like to do a Phd one day, probably when I’m too old to compete in MMA. I don’t think I could manage doing both. EB. You have 2 lovely children aged 5 and 2 who live at home with you and your husband in Southampton. What do your family think of your new added career in MMA? BT. Well my son is too young to understand at the moment, but my daughter is starting to follow in my footsteps, which is great. My husband has mixed feelings I think. We met doing Jiu Jitsu so he understands the martial arts side of it but he can’t get his head round wanting to step into a cage and fight for your life (laughs). He is incredibly supportive though! EB. I also hear you’re a bit of an adrenalin junkie? BT. Yeah, I love extreme sports! 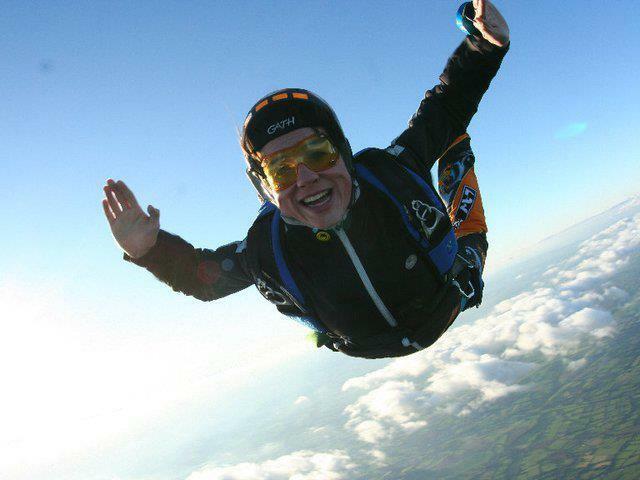 Although, I broke my leg BASE jumping a few years ago, which was a bit of a wake-up call. I’d be devastated if I got injured and couldn’t do Martial Arts. Also, having children makes you a bit more aware of you mortality, not to mention having less money (laughs). EB. You’re not a stranger to the world of Martial Arts, I hear you hold several belts, in several different Arts can you tell me what belts in which Martial Arts you have, and also how long you have been training in them for? BT. I’ve been involved in martial arts for 13 years now. I’ve trained in Kickboxing and Kung Fu for 12 years, Japanese Jiu Jitsu for 2 years and Krav Maga for 2 years. I hold a black belt in Kickboxing, second degree black belt in Kung Fu, an orange belt in Jiu Jitsu and I’ve just passed my P3 in Krav Maga. Since starting MMA I have added Wrestling, Muay Thai and BJJ to the mix. Jack of all trades, master of none springs to mind (laughs). EB. What is the difference between Japanese Jiu Jitsu and what people more commonly associate in MMA Brazilian Jiu Jitsu? BT. I wouldn’t like to generalise because there are so many different styles of Jiu Jitsu but in my experience, Brazilian Jiu Jitsu predominantly involves groundwork. In the Japanese style we practiced a lot more throws and other stand up techniques such as escaping from grab holds, evading strikes and weapon training. Both are brilliant to learn but for MMA I think the BJJ is more beneficial. EB. What is it about Martial Arts that interested you in the sport? Martial arts are my passion in life. I love the contrast that they can be beautiful and deadly at the same time. Anyone that practices a martial art to a high level knows that it involves incredible dedication and discipline and also pushes your body and mind to the limits of endurance. EB. What do you remember about your first ever training session, especially with the move into MMA? BT. I remember my first MMA lesson very clearly, I’m afraid I was a bit foolhardy and turned up to one of the top MMA gyms in the country thinking I was a bit special because I’d done martial arts. I said I didn’t need a beginner’s lesson and inadvertently ended up in one of the fighter’s sessions, as I walked in I was greeted by the head instructor of the gym who said to me in no uncertain terms….”you’re going to die”, I made it through the lesson (much to his surprise I think) but, realised that I could probably do with going back to the basics (Laughs). We live and learn! EB. Where are you training now? And what gym do you train out of? BT. I now train out of Exile Gym in Southampton. Without a doubt the friendliest most fantastic gym I have ever been to. I cannot thank them enough for the incredible support and encouragement they’ve given me over the past year. EB. You made the decision to go into MMA just over a year ago, how did this come about? BT. I think the only way to truly know how good you are at fighting is to compete, and that’s where the MMA comes in. Being locked in a cage with another trained fighter who can use pretty much any style or technique against you (with full power) is the ultimate test. I’d always liked the idea of MMA but I wasn’t sure if I was tough enough for it, it wasn’t until I started Krav Maga that I thought I should go for it, Krav Maga is also a form of mixed martial arts but there are no competitions because it is purely based on self defence, MMA is the closest thing to it and also compliments it very well. EB. 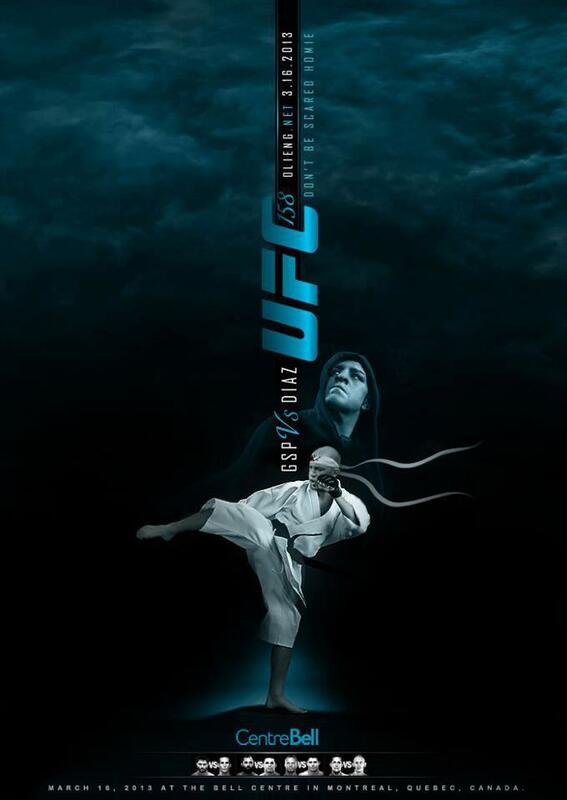 You’re part of UFC fighter Rosi Sexton’s mentorship scheme can you tell me what this is about? And how it all came about for you? BT. Yes, I’m very privileged to be on a mentorship scheme with Rosi, I can’t believe it really. I happened to be following her on facebook and she put up a post about starting the scheme and I applied straight away! 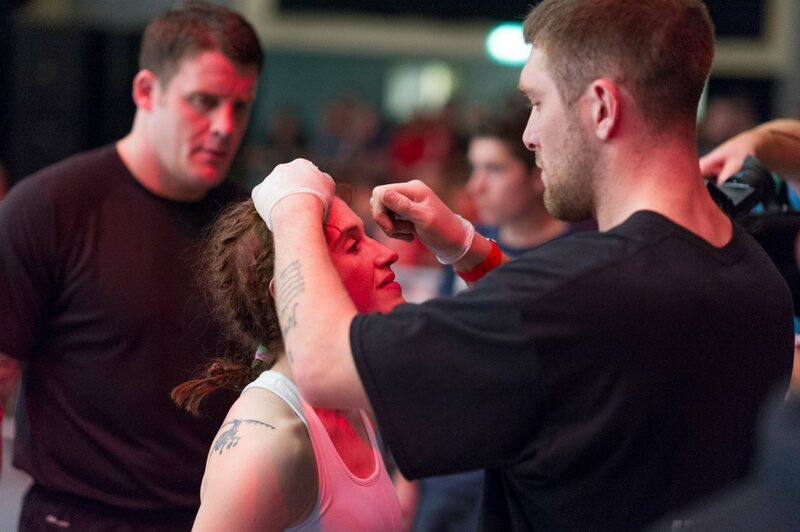 She’s given me help and advice with regard to training, nutrition, competing etc… She set up the 2 fights I’ve had so far and I’ve also been lucky enough to train with her on a couple of occasions. EB. You were due to fight Rebecca Davies on July 20th, at Merthyr Mayhem in Wales, this would have been your 3rd fight, was you approached for this fight? BT. Yes, surprisingly I have been approached for all the fights and I’ve even had to turn some down due to other commitments. I thought it was going to be hard to get match ups but not at all so far. EB. Your fighting weight is at 55kg, as a female in the sport I personally know how hard it is 1. to train with females, 2. to find females in the sport, 3. find a female in your own weight division, 4. with the same experience as yourself; how did you feel when you knew there was someone who had personally ‘asked’ to fight you? BT. I must admit I didn’t know that anyone had personally asked to fight me. I’m not sure if that’s a good thing or not (Laughs) I don’t really mind who I fight, at this stage I just want the experience. EB. Did you know at the time, that your opponent, who had asked to fight you, was not anywhere near your scheduled fight weight; although bearing in mind, you were 12 weeks out from the set fight date, which in all honesty is before professional athletes start their fight camp? BT. Yes I did know and I think she took on a huge challenge to try and loose that much weight, it was perhaps a little naive to think she could drop to that weight. Although, I read in an interview she had done, it did state that she fights at 55-60kgs so perhaps that’s her normal weight, I don’t know. EB. 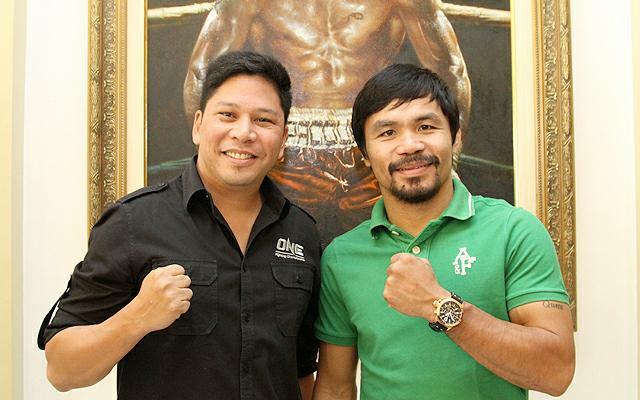 The fight was agreed at 55kg to start with, but it got changed to u60kg, this is not your normal fighting weight. I can see by you accepting this, you really wanted the fight to go ahead as long as Rebecca could weigh in u60kg on the day, but that was not to be, Rebecca came in over weight and the fight rightly so did not go ahead; how was you feeling at the time? BT. Yes I did really want to fight because I’d trained hard and I need the experience. The first MMA fight I did was u60kgs as well. After having done that I realised that a few kgs, although it doesn’t sound much, can actually make quite a lot of difference. I was disappointed not to fight but not altogether surprised to be honest. Rebecca has since apologised to me which meant a lot. She’d also had a very difficult time for personal reasons and I admire her for carrying on training under those circumstances. She’s a brave and determined lady. EB. Had you known how much weight there was for Rebecca to cut, in hindsight would you of still agreed to the fight? having gone through a big training camp yourself, dedication of your training, having your full time job, being a mum, weight cutting yourself and everything else that comes with preparing for a fight? BT. Yes, I would have agreed to the fight. I love training and I’d like to stay fighting fit as much as possible. I’m lucky I’ve not needed to cut weight yet. If anything I should have been putting weight on. Also, David Nicholas is a great promoter to work with, I would gladly go on the show if he was to invite me back again. EB. This goes to show, how much females will do to go and still fight, even if their opponent does not make weight as you still wanted the fight to go ahead, are you glad your corner said No to the fight? BT. I totally stand by my corner’s decision it was quite nice to have the decision taken out of your hands because no fighter wants to turn down a fight they’ve trained for. She was 7 kgs heavier and with rehydration that would have been closer to 10. It wouldn’t have been safe. EB. What, if anything, have you learned through this experience? Will it make you more wary of more opponents in the future? BT. Yes, I will be a lot more wary in the future. It wouldn’t matter so much if it was just down the road but at the moment I’m having to travel pretty long distances which involves organisation and expense not just for me but for whoever comes to corner and support me. EB. 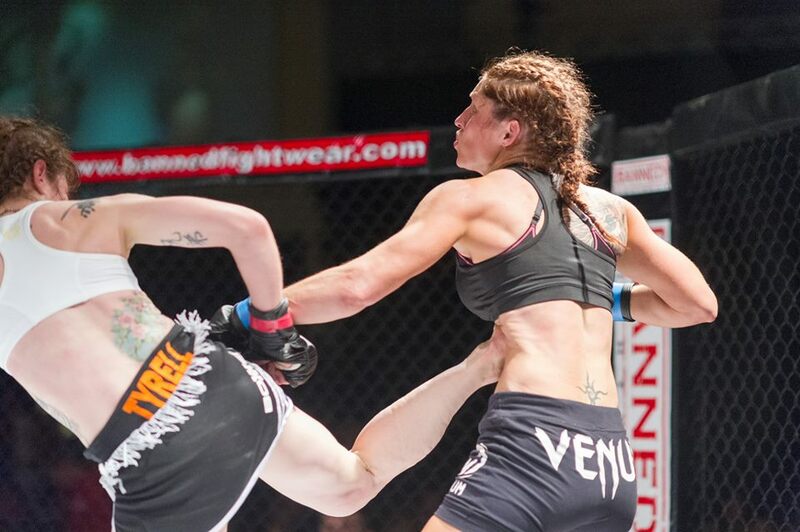 It’s just been announced by Cage Warriors that they have around 40 females to sign up, with around 18 of them being confirmed, in a new 4 weight division, which in my opinion is a long time coming; Although you are still an amateur, do you see yourself moving to the pro ranks anytime soon, especially with a organisation like Cage Warriors leading the way forward, who will offer female’s the chance to get regular fights and be evenly matched? BT. Yes that’s very exciting news! I would love to move up the ranks at some point if I’m good enough. 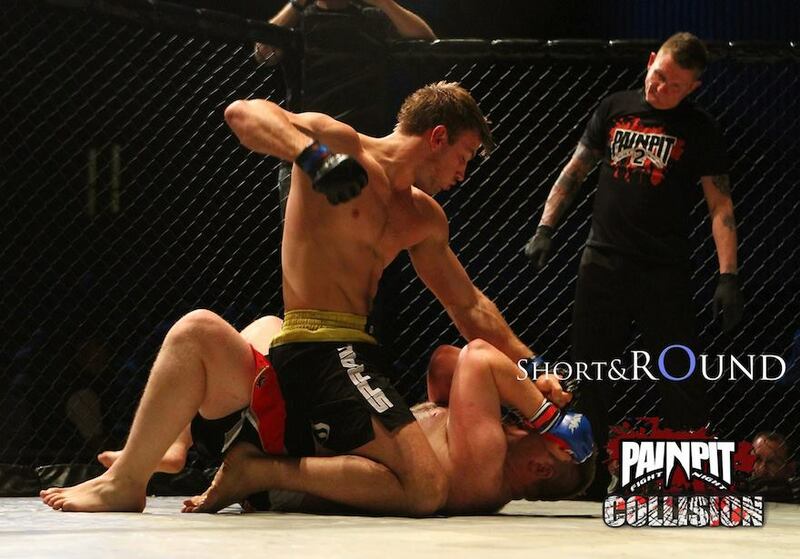 Being signed to Cage Warriors would be a dream come true and I love having a goal like that to work towards. EB. What is next for you? Do you have another fight lined up at all? BT. I have 2 Muay Thai interclub fights lined up this month. I’ve also been asked to fight on Extreme Cage Championships in Blackpool next month which is very exciting but not as yet confirmed. EB. Your fellow team mates Arthur Frost and Benny Carr were both fighting July 27th on the ShockNAwe card, which both whom won; were you there? If so how was that seeing them in true winning style? BT. Yes, I couldn’t miss that! They both did fantastically, we were all so proud to be there supporting them. 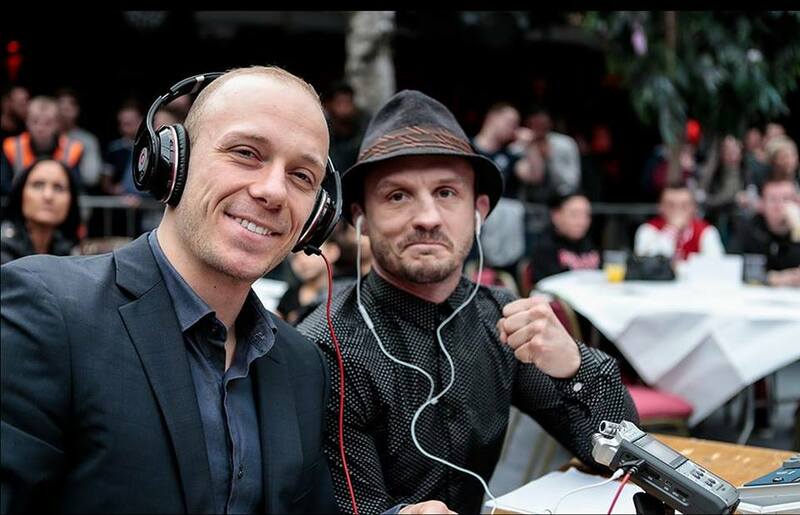 Benny’s fight was deservedly the fight of the night, they’re both superb athletes and destined for great things. BT. First and foremost I’d like to thank all my fantastic instructors, training partners and team mates at Exile Gym and Essential Krav Maga. I’d also like to thank Rosi Sexton for her invaluable insight and help, also my husband for putting up with my ridiculous training schedule and last but not least my amazing brother, Vaughan and sister in law, Lisa, for their unwavering support and for traipsing around the country after me . What is your fighting Nickname? 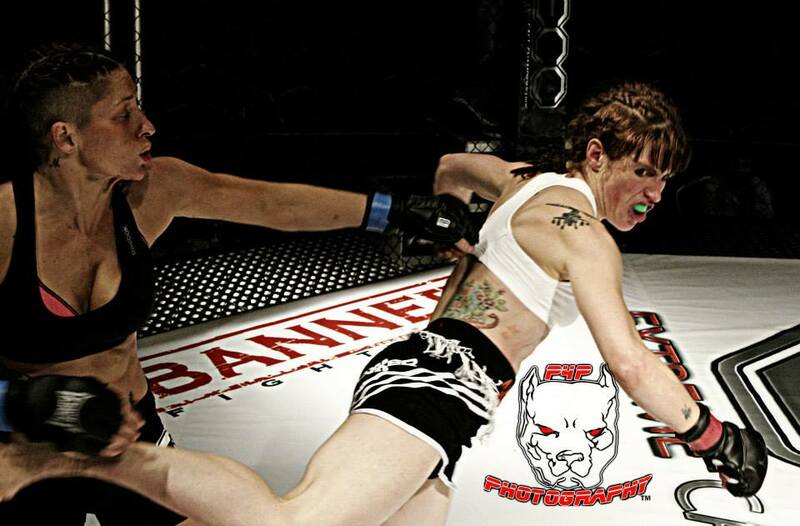 I’m going to have to say Rosi Sexton and Joanne Calderwood because they both have such unique skills. Argh that’s tough I think it’s got to be ‘Last of the Mohicans’. Definitely cake! Don’t mind what type just any cake. If you were to hold a dinner party, which 3 guests past or present would you invite and why? I would invite Gordon Ramsey so he can cook (because I really can’t! ), Bruce Lee so he can teach me the one inch punch and Will Ferrell just because he’s brilliant! November 16th Mens Health Survival of the Fittest 10k run 30 obstacles – Just for fun! Still fighting to catch up with my own back log!!! Author Emma BramfordPosted on July 13, 2013 December 30, 2013 Categories Blog, Boxing, Interview, MMA, Pain Pit, Uncategorized, WrestlingLeave a comment on Still fighting to catch up with my own back log!!! 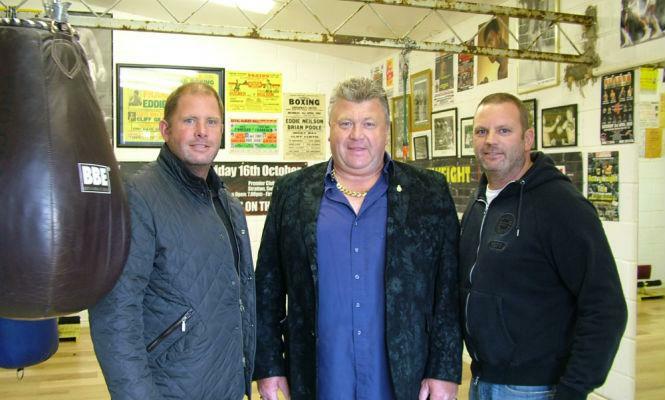 Neilson Promotions was set up in June 2008 by Eddie, Tony and Mark Neilson, with the intention of providing White Collar Boxing / Semi-Professional boxing Events in the Swindon Area. On 13 October 2012, Neilson Promotions, a Swindon-based white collar boxing promoter, put on the largest show of its kind to date. A venue verified attendance of 1398 watched ten contests at the Oasis Leisure Centre in Swindon with the main event seeing Dave ‘Bam Bam’ Gregory retain his NP Heavyweight title against Rich ‘The Tank’ Loveday over three rounds. 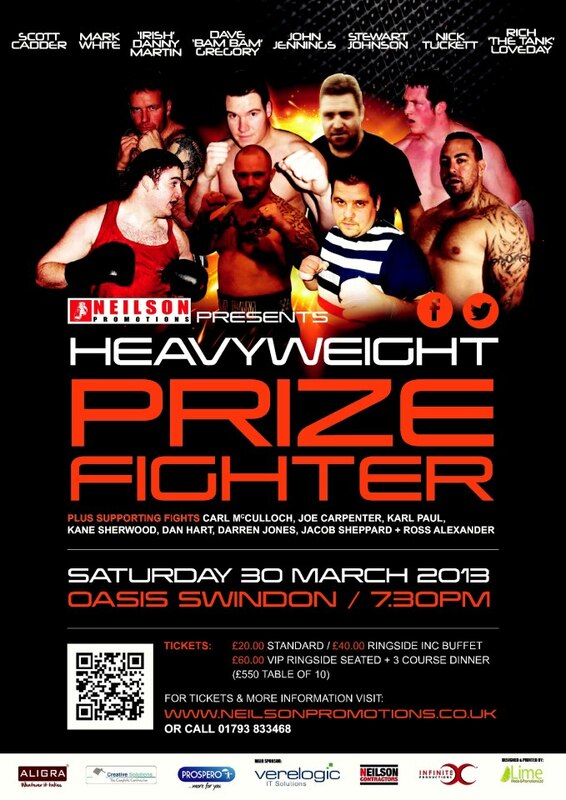 On Saturday March 30th Neilson Promotions will hold a Heavyweight Prizefighter Tournament, the first of its kind on the White Collar Scene in Swindon involving 8 Men battling it out for a grand cash prize of £2000 plus a £200 cash bonus for every KO on the night. The eight warriors taking part in the tournament include former Walcot amateur boxer Scott Cadder and Stewart Johnson also a former amateur of Walcot ABC both of whom were trained under Harold Scott. Next we have ‘Big’ Phil Williams who used to box for Penhill RBL several years ago. ‘Irish’ Danny Martin put on a great display at Neilson Promotions last event and will be looking to showcase his talents again in this tournament. Nick Tuckett is more known for his MMA, being a former British and European Jiu Jitsu champion, he has however had a few White Collar boxing Matches. Nick trains out of Dragons Lair Gym in Melksham which also happens to be home to UFC fighter Bradley ‘Bear’ Scott. Rich ‘The Tank’ Loveday also comes from a MMA background, and is yet to be stopped in his White Collar boxing career. Mark White who is originally a kickboxer, can now be seen as a regular sparring partner for other Heavyweights around town, and training out of Ringside Gym. Mark although being the oldest competitor in this tournament at the age of 40, his age should not fool you. 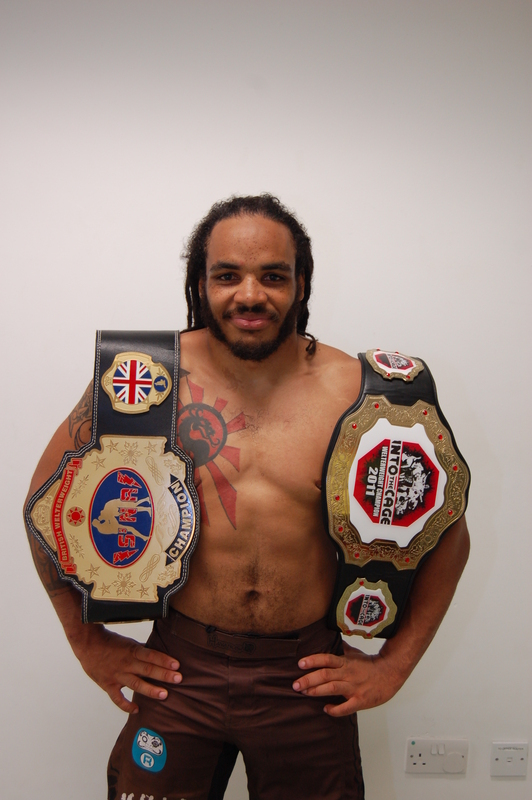 Last and by not least is current Neilson Promotions Heavyweight Champion Dave ‘Bam Bam’ Gregory, who also started his career out on the MMA scene. Gregory is a crowd pleasing Warrior with a great heart who has a NEVER GIVE UP attitude. The Draw for the Heavyweight Prizefighter Event took part at the Oasis Leisure Centre on Saturday 16th March by Main Sponsor CEO Kevin Metcalfe of Verelogic Group and Trophy Supplier Vince Ayris. Tickets are still available ( although some limited ) and are priced at £60 each or £550 for Ringside Tables,which seats 10 ( include a three course meal, waitress service), therefore a Black Tie/Dark Suit Dress Code is in place on Ringside Table Tickets Only, £40 for Ringside Seats and VIP bar access, £20 standing/limited seated. There is also a disabled access and viewing stage as with all Neilson Promotions Events. Doors open at 6:30 and the first fight is scheduled for 7:30. Neilsons Boxing Gym is the new home of the ‘TEAM NEILSON’ White Collar Boxers, who will be fighting at various prestigious venues throughout the year. There are White Collar Boxing Training classes now running at Neilson’s gym on Monday, Wednesday and Friday evenings (by invitation only) with Head Coach Eddie Neilson. If you’ve not experienced any of The Neilson Promotions Boxing Events that have happend over the last few years over Swindon, then I can only say you really do not know what you are missing out on, I have had the pleasure of being at many of The Neilson Promotions Events and rest assured if its Quality, Professionalism with a Great Atmosphere you are looking for from start to finish then you must attend this Saturday’s event, I know I will be. For those of you who do not know what White Collar Boxing is, then here goes….. White-collar boxing is a form of boxing in which men and women in white collar professions train to fight at special events. Most have had no prior boxing experience. White Collar Boxing originated in the legendary Gleason’s gym in New York in 1988. The first contest was held between Dr. Richard Novak an attorney and Dr. David Lawrence who held a Phd. in English Literature. After the contest the two Gentlemen went to dinner to celebrate the birth of a new sport. Since then White Collar Boxing has been the fastest growing corporate contact sport in the world. John Rooney Jr. then owner and operator of the Gleason’s Gym UK franchise introduced White Collar Boxing to the City of London in 2003. This is My First Ever WordPress Blog, well Blog in General, it has been a good 8 months in the making – yeah I know one of these does not take that long to set up, but since it was my good friends Idea for me to do a Blog between his work schedule and my own, getting the right mix of the things I wanted and how I wanted it too look has been lets just say trying, and as I still get to grips with this Blog I will be adding more features & designs, so please bare with me. Since this is my first ever Blog it is really only a Tester blog as such to see where I need to move things around, add things etc but also a good time to make everyone know that My Blog is now live. Primarily set up as I was attending so many MMA and Boxing events my friend thought I should write about them, but aswell as having my views on the events I have attended, My Blog will also consist of all things MMA related, Boxing since Froch v Kessler has now revived the long dead scene in my eyes! General views on Daily Life and Martial Training, Dealing With The Kids, but more importantly I think, I will be #KeepingItReal throughout, Saying it how it is, #HardHitting, These are all my own views and any of you that know me or have spoken to me on Twitter or Facebook know that I Say It How It is…. You Wont Like Wot I Have To Say More Than Likely Most Of The Time, but to be honest i’m only saying what most people are thinking and just dont wont admit to it…. ONLY 16 DAYS 2 GO!! !